My new favorite Wild Rails stash quilt resulted from a huge mistake when I cut hundreds of strips the wrong size for a rail fence pattern. 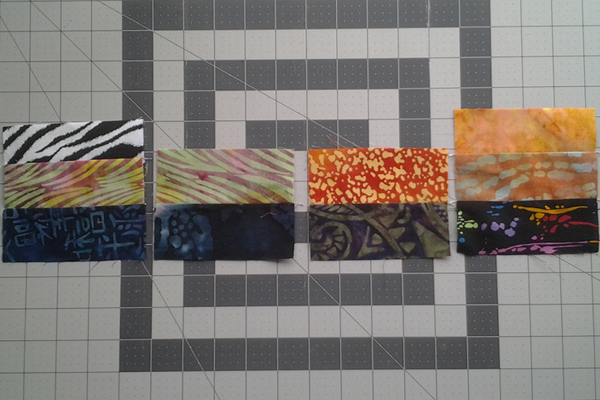 Wanting to use black fabrics in a rail fence, I cut strips from assorted black fat quarters. I mistakenly shortened the length by half an inch which threw off the square completely. Not giving much thought as to a remedy on the spot, I sealed them up in a tidy plastic bag. They sat for over ten years in my scrap bag. Every time I saw them, I’d give a moment’s thought as to how to use them…and back in the bag they’d go. The rail fence pattern has been around for a long time with many variations. I’m particularly fond of the triple rail which allows me to showcase multiple colors. But every rail fence pattern I’ve seen has equal size strips within each block. Perhaps that’s why it took me so long to figure out how to fix this one. It’s another reminder that once we step out of the box, there are a multitude of options waiting to be tried. It wasn’t until I recently moved and unpacked those strips one more time, that an idea occurred to me. Since last seeing these mis-cut pieces, my quilting had evolved from focusing on specific patterns towards an improv approach. 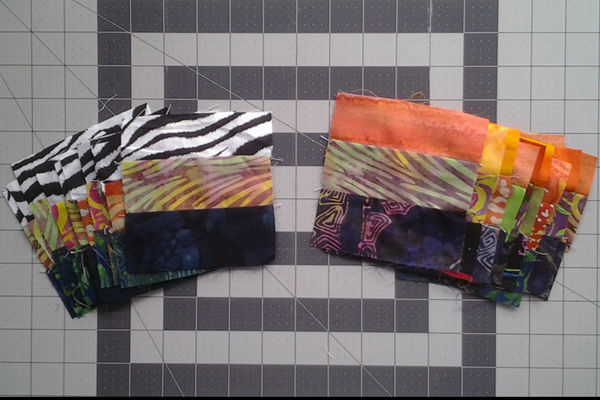 When I saw a couple zebra stripe fat quarters, a new design idea began. The solution was simple. Just make one of the rails narrower to achieve a square block. So with that simple modification in place, I was working on a triple rail fence with one black rail, a narrow bright yellow-orange rail, and a narrow zebra rail. It was exciting to move past my conventional approach towards a freer style that lets the fabrics guide me. Wild Rails quilt folded to show diagonal strip quilt back to the left. Just don’t wait at long as I did! I was so stuck on the traditional pattern, I couldn’t see what other options there may be. At a time when I was making ocean-themed blue and green rail fence quilts, someone suggested I make one with black fabric. I’d never quilted with much black fabric, never mind using it as a dominant color. While looking through my fabric, I found I had lots of black and other dark color batik fat-quarters. 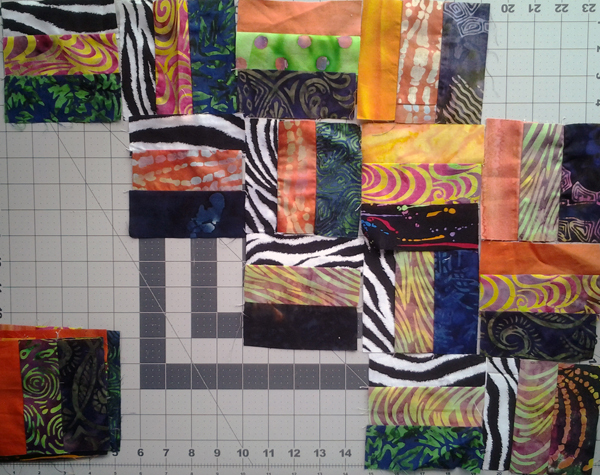 The quilt size I wanted to make would need 400 squares, so I started cutting the strips. The fabrics looked great together and I got excited to start sewing. Then I realized I had cut all those 400 pieces the wrong size. Each was 1/2” shorter than it should have been. That meant my squares would now be rectangles and the pattern wouldn’t work. It took until almost 15 years later for a new idea to develop. I’d been steering away from traditional patterns for some time and I now saw these black pieces in a new light offering a multitude of possibilities. Improv! Fortunately, this was also when I was in my ‘must use what I have’ mindset which kept me more focused on fabric selection. 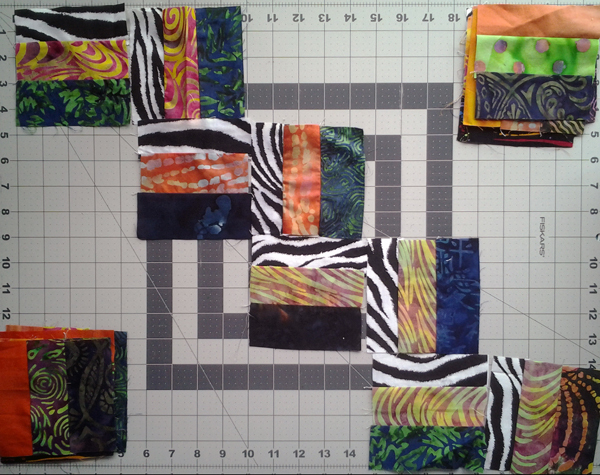 Using my new improvisational perspective combined with stash quilting, a beautiful quilt was in the making. It all came together with a simple solution. By cutting one rail narrower to accommodate the shorter length, the block was now square and the rail pattern would work. Who knew? Trust and follow your instincts and you’ll be both happy and surprised with the outcome. Divide squares into two piles, one for each narrow rail color. 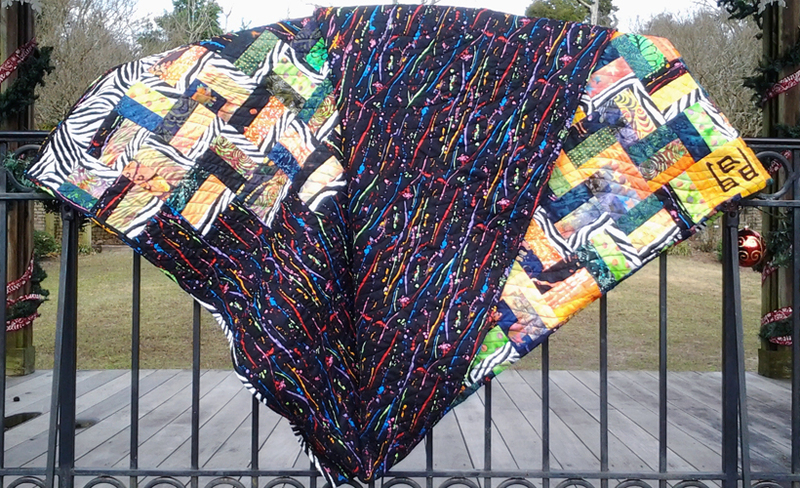 Of course, I needed something bright to stand out between these two rails, and my quilt was coming together. 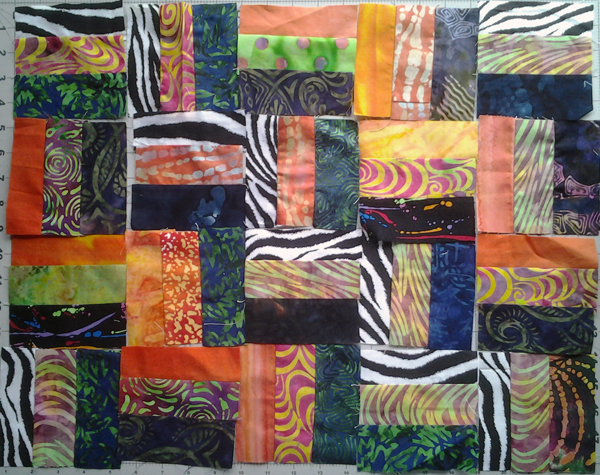 Since this was now going to be a zebra quilt, I needed to add some wild colors. A bright variety of prints in the middle of the rail block looked fabulous next to the darker fabrics. Using multiple fat-quarters as a replacement for yardage is my favorite way to create a bold design. If I need two yards of yellow fabric, I’d much rather use eight fat quarters that are predominantly yellow. Using multiple fabrics adds so much interest and creates a beautiful visual design. It worked great in this quilt. Lay in the contrasting narrow rail and notice the black rail beginning to develop. The zebra and orange rails alternate between the dominant black rails. 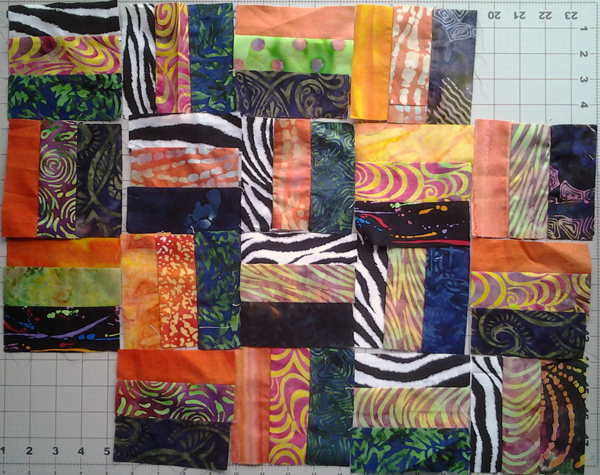 The blocks went together quickly, and my Wild Rails quilt came to life. The dark rails are a perfect contrast to both the narrow zebra stripe and yellow-orange rails. It’s bright, colorful and filled with endless patterns, which is why I love batiks so much. In the future, this will definitely be the method I use for any rail fence pattern. Just the slight change in size of the top rails makes them much more prominent and interesting to look at. I’ve created a downloadable PDF that shows how I modified this pattern to fit my incorrectly cut strips. Give it a try next time you’re thinking about a rail fence and I think you’ll be happy you did. It’s a great variation on a tried and true quilt block. 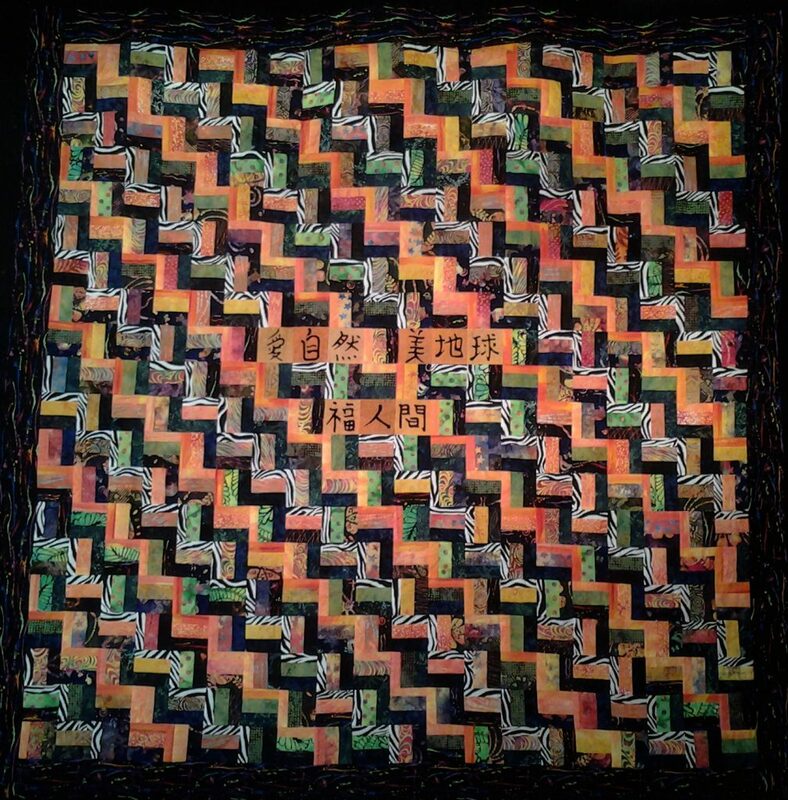 Every quilt has a back story. While I was excited to get this quilt top finished, the best part of my Wild Rails quilt story is how the back turned out. Since I made so many extra blocks, I used them to create a full, corner to corner diagonal pattern that created a captivating, modern design. The backing fabric, while filled with color, becomes subdued next to the bold fabrics. It creates an intriguing negative space to showcase the diagonal rails. It turned out great and I love it! The label hasn’t been sewn on yet, and for a moment I wasn’t sure which side to put it on. The diagonal back is stunning, and I hate to hide it! Don’t let a mistake stop you. Wait until you see what you design when you follow your creative spirit. Find a way to turn every mistake into an exciting opportunity. It may take a bit of thought, but don’t give up. 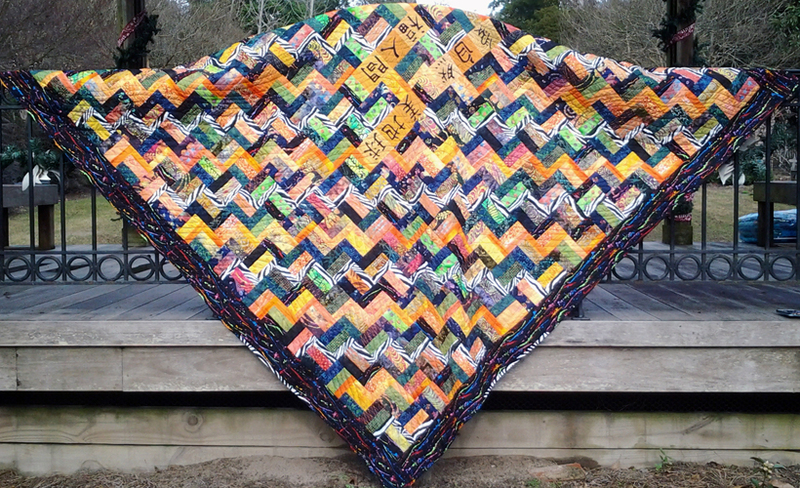 Get your imagination flowing and find a fabulous solution to create an exceptional quilt. Learn something new and be inspired to create more beauty in your life every day.